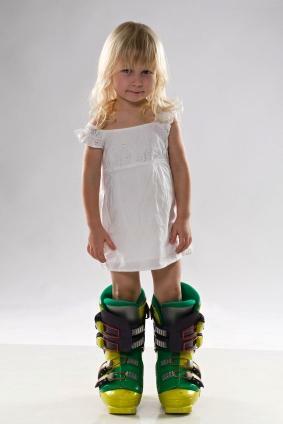 It makes a lot of sense to purchase discount ski boots for your kids. Let's face it, your kids will keep growing, and whatever boots you buy them this year, won't fit next season. By purchasing discounted ski boots you'll feel okay about having to buy a new pair next year. Ski boots could be one of the most important ski equipment purchases you make. When skiing, it's very important that your foot is held snugly, preventing your ankle from rolling or your feet from sliding forward in the boot. When your foot is secure in the boot, your foot is secure on the ski, giving you more control over every movement. This element of control is especially important for children, most of whom are still learning to ski. While you may be tempted to purchase ski boots that your child can grow into, just remember that a properly fitted ski boot can help prevent falls and injury. Just because you're considering purchasing your child discount ski boots doesn't mean you're purchasing "bad" or "old" boots. Discount boots are often just as good as new boots purchased at full price. You can purchase discounted boots that have never been used, or you can pick up quality used boots from a variety of sources. Just like cars, when new ski boots come out, the older models often go on sale or receive a slight discount. This is especially true if the manufacturer made an updated version of the exact same boot, making last year's boot "out of date." If you can find a good deal on these boots, scoop them up! They've never been used, so you won't have to wonder whether there are problems with the boot that you can't see. The best time of year to get good deals on your kids' ski boots is at the very end of the ski season. If your child's going through a growth spurt, this may not be advisable, because if you buy next year's boots this year, and he outgrows them before the season even starts, that's just money down the drain. If, however, you think your child's foot size has stabilized, make sure you shop the sales at the end of the season. You can sometimes find boots as much as half-off their regular price as stores try to move winter merchandise to bring summer stock into the store. When you purchase equipment from well-known used sporting goods stores like Play It Again Sports, you know that the equipment has gone through a vetting process. The store won't sell equipment that's too beaten down or battered - it has to be usable, so you can feel confident that even though the ski boots you're purchasing are used, they're going to last for at least as long as your child can wear them. If you're tempted to purchase your child's boots through online vendors, chances are you'll get a great deal. Sites like eBay and Craigslist allow private sellers and stores to list sporting goods for sale, and most big name sporting goods stores also have a "sale" section on their website. The only problem with purchasing online is that you're not giving your child an opportunity to try on the boot to make sure it fits. Since fit is such an important part of the purchasing process, you may want to do your research in-store; then make your purchase online. You want to involve your child in the purchasing process in order to make sure the boots fit properly and meet their expectations in terms of colors and style. To avoid an in-store meltdown when you steer your daughter toward the discounted boots, make sure you discuss budget with her before you enter the store. That way she'll know exactly what you're willing to spend and won't be upset when you keep her from trying on the full-priced options.